Welcome to our brand new link up. Travel is something that I love to write about and I have been frustrated that there aren't many places to share and link up posts. I decided to create Travel Tales as a place to share a huge range of travel posts and to discover new places myself. You can link up days out, holidays, family travel, solo travel, romantic breaks for two, girls holidays, hotel reviews, day trips, museum reviews, attraction reviews, theme parks....... as long as your post features travel, you're in! 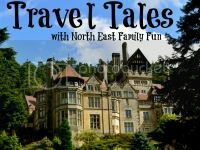 I will add all posts to our Travel Tales Pinterest board and if you tweet me (@nefamilyfun) your links, I will retweet. Please take the time to read the rules and grab our badge before linking. Enjoy! What a great idea for a link Samantha, I'll definitely be linking up to this. Great idea, can you link day trips too?